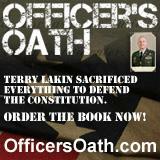 GET TERRY'S BOOK AND READ IT. IT'S AN AMAZING STORY. Go head, roll your eyes. But then watch the press conference. How much evidence do we need? The Obama documents are forgeries. Watch Now. Read Gary Wilmott's Letter to Sen. Kamala Harris Concerning Her Natural Born Citizen Status (or lack thereof). Click here to make a contribution to the Terry Lakin Action Fund. All content ©2017Terry Lakin Action Fund. Material May Linked to. Content that is copied must maintain its context and be referenced back to the site.